Here are seven Bible verses that should be easy for preschoolers to learn. 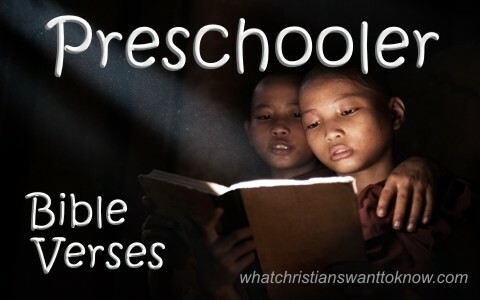 Memorizing Scripture is not as hard as it appears for preschoolers. They learn quickly from repetition and repeating a Bible verse, once per week, is just about as easy as it gets when it comes to memorizing Bible verses, but what the caregiver discovers is that they end up memorizing the verse too. I believe that there are some Bible verses that are more important for children or grandchildren to learn than others, but it’s great to begin even when they’re one or two years old. They are taking in more than you know. To be sure, Acts 4:12 is of supreme importance for a child to know, especially in this pluralist, many-paths-to-God society we live in because their philosophy is radically different from what the Bible says. Indisputably, we must teach our children than no one can be saved in any other way except through Jesus Christ; period! Once again, the Pharisees tried to trap Jesus and “one of them, a lawyer, asked him a question to test him. “Teacher, which is the great commandment in the Law” (Matt 22:35-36)? Of course, Jesus knew what they were trying to do to Him and so He tells them what they should have already known, and that was “You shall love the Lord your God with all your heart and with all your soul and with all your mind. This is the great and first commandment” (Matt 22:37-38). Of course we are to love our neighbor to the same extent that we love our selves in that we provide for our own needs, we do things to help ourselves, and we make sure we’ve got adequate clothing and food, so that is the call for every one of us, in regards to how we treat our neighbor. These two are so important that Jesus said “On these two commandments depend all the Law and the Prophets” (Matt 22:40). There will be times when a child disobeys but that’s their nature, just like it is ours. Like a toddler falling when learning how to walk, they don’t give up. They might cry and get mad, but they get back up because they’re not satisfied with staying on the ground. Children will face a world where they will fall time and again, sometimes even being pushed, so remind them that the Lord will help those who fall down and He will use parents, grandparents, and foster parents but there will also be times when children will be tempted to compromise and do something someone wants them to do but they know it’s wrong. If they remember the Apostle Peter’s words, they might be able to make the right choice, knowing they “must obey God rather than” Johnny or Julie. Children should know that the promises of God are rock solid and He never breaks even one of them. If children know that God may give them a longer, more blessed life by obeying their parents, they might take that with them even into adulthood. It never qualifies it by saying “if you have good parents, honor them” but simply “Honor your father and mother.” It should not matter if they are Christian’s or not. It doesn’t matter to God in regards to how we treat them; it only matters to God whether we’ll honor them or not. Children should honor their parents but their parents should honor their own parents, otherwise the children might have a hard time honoring them. We could all memorize these verses and hide them in our hearts because you never outgrow the need for forgiveness. Since all of us fall short of God’s glory (Rom 3:23), there will be a lot of trespasses (sins) to forgive but there will also be a lot of trespasses we commit that will need the forgiveness of others. If we are not forgiving, even to the point of apologizing to our own children and grandchildren when we are wrong, we can’t expect them to develop a forgiving nature. Believe me, now a grandfather; more is caught than taught. What greater love is there than in John 3:16? What greater verse to tell children or grandchildren about when speaking to them about God’s great love? This verse has been on billboards, greeting cards, and church bulletins, but the greatest love in the history of time was displayed on the cross. Here was Jesus, dying for us while still sinners and wicked enemies of His (Rom 5:8-10), dying for ungodly people (Rom 5:6), yet here is God, through Jesus Christ, giving every person eternal life when they believe in the Son of God. This verse is probably the most memorized and well known Bible verse of all, but that might have desensitized us to its great significance. I’m going to ask you to think about Jesus’ death for a moment. Paul writes, “one will scarcely die for a righteous person—though perhaps for a good person one would dare even to die— but God shows his love for us in that while we were still sinners, Christ died for us” (Rom 5:7-8), so imagine such a love as this love; a love that is willing to die for those who hate them, despise them, and even crucify them. Previous post: How Did The Calendar Begin And Why Did The Years Change After Jesus Was On Earth? Next post: What Does It Mean To Be Saved By Grace?